There are many benefits of avocado oil and avocado seeds that make this fruit not just delicious, but also unique. Avocado oil is one of my favorite oils for cooking. The avocado is also known by its plant name Persea americana. What’s interesting about avocado oil is that it’s one of the few oils made from the fruit instead of the seed, as is the case with sunflower seed oil, pumpkin seed oil, and flaxseed oil. Olive oil is made from both from the fruit and seed. The taste of avocado oil may also come as a pleasant surprise—it doesn’t taste like avocados. Instead, it has a mild, buttery, and nutty flavor, and a light and smooth texture. Avocado oil is loaded with nutrition, most notably in its fat content. In particular, around 70% of avocado oil contains a monounsaturated omega-9 fatty acid called oleic acid. Also, about 16% of avocado oil is saturated fat, and 14% is polyunsaturated fatty acids, which contain omega-6 and omega-3 fatty acids. The avocado itself also contains plenty of nutrients, including potassium, magnesium, folate, choline, vitamin A, vitamin C, vitamin E, vitamin B5, vitamin B6, vitamin K, lutein, zeaxanthin, glutathione, and phytosterols such as beta-sitosterol. Avocado oil also contains high levels of antioxidants including carotenoids, tocopherols, polyphenols, and proanthocyanidins. The following is a detailed avocado oil nutrition chart for one tablespoon of oil, which is likely the amount used in the preparation of meals. There are also many health benefits associated with avocado oil. What makes avocado oil so great is that it has a stable structure that allows it to be cooked at a high temperature. The smoke point is the temperature required to cause a cooking oil or fat to break down and burn. As a result, the flavor from the oil is lost, and its beneficial nutrients are destroyed. This is common with vegetable oils like soy, canola, and corn oils. Avocado oil, on the other hand, has a smoke point of 520 degrees Fahrenheit, which makes it ideal for frying and baking. So, how many avocado oil uses are there? The following are the different ways avocado oil can benefit your health. Skin health: There are various avocado oil benefits for skin. In a study published in the journal Evidence-Based Complementary and Alternative Medicine in 2013, researchers found that avocado oil can treat skin wounds by increasing collagen and reducing inflammatory cells. Avocado oil can be used topically as a skin moisturizer and body scrub for dry skin. There are also avocado oil benefits for hair; it can be used as a natural conditioner, and it can help enhance hair growth and relieve an itchy scalp. The oil is also used for cuts, burns, blisters, rashes, sunburns, stings, and bug bites. Periodontal disease: Avocado oil is considered a natural remedy to treat or prevent tooth loss and inflammation due to periodontal disease. In a study published in the Journal of Periodontal Disease in 2006, avocado oil and soybean oil was found to be useful in treating the condition. Researchers studied human periodontal ligaments and bone cells, and found that avocado and soybean oils reduced inflammation by inhibiting pro-inflammatory cytokine molecules. As a result, avocado and soybean oil may be helpful in the prevention of bone erosion linked with periodontal disease. The antiseptic properties of avocado oil can benefit the mouth when you use the oil as a mouthwash. Arthritis: There is also evidence that avocado oil benefits arthritic conditions. A combination of avocado oil and soybean oil extracts are thought to improve joint function and reduce pain and stiffness, which result in a reduced dependence on painkillers. In a study published in the journal Arthritis and Rheumatism in 1998, researchers found that an avocado oil and soybean oil extract significantly reduced the symptoms of osteoarthritis in 85 patients. Psoriasis: In a study published in the journal Dermatology in 2001, a combination of vitamin B12 and avocado oil effectively treated patients with psoriasis during a 12-week trial. By comparison, the vitamin E cream control group showed improvement after the first four weeks of the study, but after that the effects from the cream stopped. The researchers concluded that the vitamin B12 and avocado oil combination has potential as a long-term therapy option for psoriasis. The anti-inflammatory properties in avocado oil can also provide relief to those with other skin conditions, including eczema and keratosis pilaris. Lowers cholesterol and heart health: The beta-sitosterol in avocado oil has been found to reduce cholesterol and heart disease in various studies. Beta-sitosterol is considered the equivalent to cholesterol found in animal foods like meat or eggs. Scientific evidence also suggests that avocado oil can prevent heart attacks and stroke in diabetic patients. The oil is thought to improve the overall blood lipid count and reduce the concentration of LDL (“bad”) cholesterol. Helps improve weight loss: Several studies have also found that avocados support weight control, through its oleic acid content. Diets that are rich in monounsaturated fatty acids such as oleic acid can protect against abdominal fat accumulation, according to a study published in the journal Diabetes Care in 2007. Reduces high blood pressure: Avocado oil can also reduce blood pressure. In an animal study published in the Journal of Ethnopharmacology in 2005, researchers found that a diet high in avocado oil significantly altered the levels of essential fatty acids in the kidneys. In turn, the kidneys responded differently to blood pressure-regulating hormones in the body. As a result, the researchers concluded that regular consumption of avocado oil may improve blood pressure. Other health benefits: Avocado oil is also used to treat other health conditions, including cancer, liver disease, and diabetes. Avocado oil is also thought to protect against DNA damage and improve eye health. Studies have also found that avocado oil boosts the absorption of carotenoids in food. What are the best ways to incorporate avocado oil in the diet? For starters, it can be used when roasting root vegetables such as potatoes, sweet potatoes, carrots, parsley root, and turnips. It can be also used when grilling vegetables, and in salad dressings, marinades, soups, stir-fries, baked goods, sauces, smoothies, pesto, pizza, and kale chips. You can drizzle avocado oil on just about anything. It also makes a surprisingly good addition to fruit salads, and is thought to be a good replacement for extra virgin olive oil, especially since olive oil is best when cooked at lower temperatures. Avocado oil also can be added to dips, especially hummus and guacamole. Here is a goat cheese and sun-dried tomato dip with avocado oil that is easy to prepare and serves up to six people. In a small pan, sauté the garlic in avocado oil on very low temperature until the garlic is a slightly blond color. In a food processor, mix the oil and garlic, basil, cilantro, sun-dried tomatoes, and salt and pepper until the ingredients are smooth. Spread the goat cheese into a small glass container or shallow platter. Evenly spread the herb mixture over the goat cheese, and add the chopped olives on top. 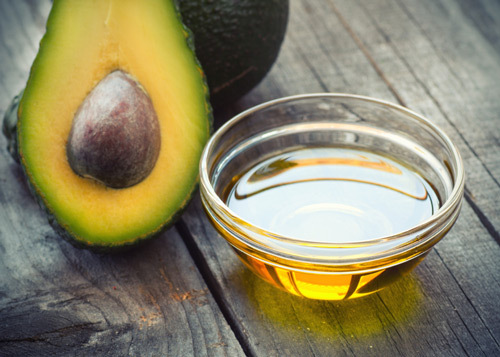 What Is the Best Avocado Oil? The best type of avocado oil is extra virgin, cold-pressed, and comes in a dark glass bottle. Look for a certified non-GMO label. It is also a good idea to store your oil either in the refrigerator or in a dark place like the pantry. This will keep it away from sunlight and protect its nutrients. High-quality avocado oil at a health food store will likely cost around $15 to $30. “Vegetable oil, avocado,” Self Nutrition Data web site; http://nutritiondata.self.com/facts/fats-and-oils/620/2, last accessed February 25, 2016. “20 Ways to Use Avocado Oil,” The Dr. Oz Show web site, February 1, 2016; http://www.doctoroz.com/gallery/20-ways-use-avocado-oil., last accessed March 1, 2016. De Oliveira, A.P., et al., “Effect of semisolid formulation of persea Americana mill (avocado) oil on wound healing in rats,” Evidence-Based Complementary and Alternative Medicine, 2013; 2013: 472382, doi: 10.1155/2013/472382. Paniagua, J.A., et al., “Monounsaturated fat-rich diet prevents central body fat distribution and decreases postprandial adiponectin expression induced by a carbohydrate-rich diet in insulin-resistant subjects,” Diabetes Care, 2007; 30(7): 1,717–1,723. Maheu, E., et al., “Symptomatic efficacy of avocado/soybean unsaponifiables in the treatment of osteoarthritis of the knee and hip: a prospective, randomized, double-blind, placebo-controlled, multicenter clinical trial with a six-month treatment period and a two-month followup demonstrating a persistent effect,” Arthritis and Rheumatism, 1998; 41(1): 81–91. Christiansen, B.A., et al., “Management of Osteoarthritis with Avocado/Soybean Unsaponifiables,” Cartilage, 2015; 6(1): 30–44, doi: 10.1177/1947603514554992. Stucker, M., et al., “Vitamin B(12) cream containing avocado oil in the therapy of plaque psoriasis,” Dermatology, 2001; 203(2): 141–147. Unlu, N.Z., “Carotenoid Absorption from Salad and Salsa by Humans Is Enhanced by the Addition of Avocado or Avocado Oil,” The Journal of Nutrition, March 1, 2005; 135(3): 431–436. Dreher, M.L., et al., “Hass Avocado Composition and Potential Health Effects,” Food Science and Nutrition, 2013; 53(7): 738–750, doi: 10.1080/10408398.2011.556759. “The Many Proven Benefits of Avocado Oil,” Avocado Oil Benefits web site; http://avocadooilbenefits.net/, last accessed February 25, 2016. “What’s So Healthy about Avocado Oil?” Marks Daily Apple web site; http://www.marksdailyapple.com/whats-so-healthy-about-avocado-oil/#axzz41CID84ZL, last accessed February 25, 2016. Roizman, T., “What Are the Benefits of Avocado Oil?” Livestrong web site last updated January 25, 2016; http://www.livestrong.com/article/408594-what-are-the-benefits-of-avocado-oil/, last accessed March 1, 2016.